The U.S. Geological Survey’s (USGS) Water Availability and Use Science Program (WAUSP) goals are to provide a more accurate assessment of the status of the water resources of the United States and assist in the determination of the quantity and quality of water that is available for beneficial uses. These assessments would identify long-term trends or changes in water availability since the 1950s in the United States and help to develop the basis for an improved ability to forecast water availability for future economic, energy-production, and environmental uses. The National Water Census (http://water.usgs.gov/watercensus/), a research program of the WAUSP, supports studies to develop new water accounting tools and assess water availability at the regional and national scales. Studies supported by this program target focus areas with identified water availability concerns and topical science themes related to the use of water within a specific type of environmental setting. The topical study described here focuses on understanding the relation between production of unconventional oil and gas (UOG) for energy and the water needed to produce and sustain this type of energy development. This relation applies to the life-cycle of renewable and nonrenewable forms of UOG energy and includes extraction, production, refinement, delivery, and disposal of waste byproducts. Water-use data and models derived from this topical study will be applied to other similar oil and gas plays within the United States to help resource managers assess and account for water used or needed in these areas. 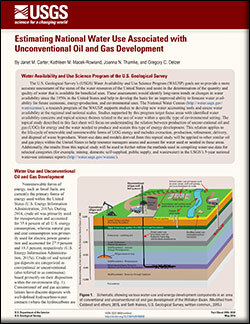 Additionally, the results from this topical study will be used to further refine the methods used in compiling water-use data for selected categories (for example, mining, domestic self-supplied, public supply, and wastewater) in the USGS’s 5-year national water-use estimates reports (http://water.usgs.gov/watuse/). Starting in the 2000s, technological advances, scarcity of access to conventional oil and gas accumulations, and the rise of oil and gas prices resulted in development of UOG accumulations. The UOG resources in the United States are being produced using horizontal drilling technologies, which expose a larger amount of reservoir for thin horizontal units to the wellbore compared to vertical wells (see fig. 1 below). Once the well is drilled, fluid (typically water with additives) and proppant (solid material such as silica sand or man-made ceramics) is pumped into the well at high pressure, opening cracks that release oil, gas, or both through a process known as hydraulic fracturing (or fracking), which stimulates movement of hydrocarbons in tight (low permeability and porosity, typically shale) formations. Rapid UOG development throughout the Nation has led to hundreds of thousands of wells being hydraulically fractured annually. Water availability and the potential for reduction in aquifer storage volumes are important considerations in UOG settings. The process of developing an oil or gas well in a tight shale formation requires large volumes of water for initial fracturing processes: about 2 million gallons per oil well and 4.1 million gallons per gas well. Additional water is needed for re-fracturing and borehole maintenance; indirect water uses, such as crew camps and road dust abatement; and ancillary uses, such as supportive energy industries, commercial developments, and recreation (see figure 1 below). These additional water uses have not been quantified on a regional scale. Phase I.—Quantify water use associated with UOG development at a pilot site, develop an estimation model, and determine associated uncertainty. Phase II.—Test the estimation model in other similar plays throughout the Nation to evaluate model capabilities for estimating water use associated with UOG development. Phase III.—Finalize estimation model and prepare for national assessment. 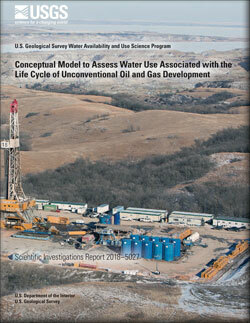 The Williston Basin was selected as the pilot site for Phase I of this topical study. Since 2005, technological advances have rapidly expanded the production from continuous formations in the Northern Great Plains, most notably the Bakken and Three Forks Formations of the Williston Basin in North Dakota and Montana. The Williston Basin provides a unique opportunity to characterize water use associated with UOG development because water use in the Williston Basin was relatively stable from year to year before 2005; therefore, any substantive change in water use since may be attributed to water-use needs to support UOG development. Figure 1. Schematic showing various water-use and energy-development components in an area of conventional and unconventional oil and gas development of the Williston Basin. Carter, Janet M.; Macek-Rowland, Kathleen M.; Thamke, Joanna N.; Delzer, Gregory C.
Carter, J.M., Macek-Rowland, K.M., Thamke, J.N., Delzer, G.C., 2016, Estimating national water use associated with unconventional oil and gas development: U.S. Geological Survey Fact Sheet 2016–3032, 6 p., http://dx.doi.org/10.3133/fs20163032.